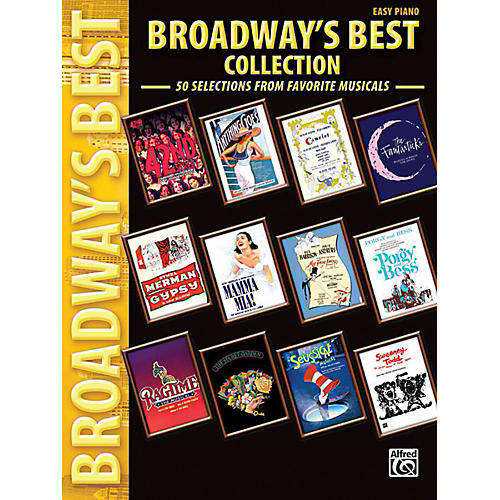 This comprehensive collection is jam-packed with Broadway favorites from the past six decades! The 50 selections include hits from 42nd Street, Anything Goes, Camelot, The Fantasticks, Gypsy, Mamma Mia!, My Fair Lady, Porgy and Bess, Ragtime, The Secret Garden, Seussical the Musical, and Sweeney Todd. Titles: 42nd Street * All for You * All I Need Is the Girl * Alone in the Universe * Anything Goes * The Ballad of Sweeney Todd * Bess, You Is My Woman Now * Biggest Blame Fool * Blow, Gabriel, Blow * By the Sea * Camelot * Easy to Love * Everything's Coming Up Roses * Get Me to the Church on Time * Goodbye, My Love * How Could I Ever Know? * I Could've Danced All Night * I Do, I Do, I Do, I Do, I Do * I Get a Kick Out of You * I Loved You Once in Silence * I Only Have Eyes for You * If Ever I Would Leave You * It Ain't Necessarily So * It's De-Lovely * I've Grown Accustomed to Her Face * Johanna * Knowing Me, Knowing You * Let Me Entertain You * Lily's Eyes * Lullaby of Broadway * Make Them Hear You * Mamma Mia! * Not While I'm Around * Oh, The Thinks You Can Think * On the Street Where You Live * Pretty Women * Soon It's Gonna Rain * Summertime * Take a Chance on Me * The Gold Digger's Song (We're in the Money) * The Rain in Spain * The Simple Joys of Maidenhood * The Winner Takes It All * Together Wherever We Go * Try to Remember * With a Little Bit of Luck * Wouldn't It Be Loverly * You Are Your Daddy's Son * You're Getting to Be a Habit with Me * You're the Top. 208 pages.